Find out more about customer relationship management software and trends in the CRM industry. Customer relationship management (CRM) is a term that refers to practices, strategies and technologies that companies use to manage and analyze customer interactions and data throughout the customer lifecycle, with the goal of improving business relationships with customers, assisting in customer retention and driving sales growth. CRM systems are designed to compile information on customers across different channels – or points of contact between the customer and the company — which could include the company’s website, telephone, live chat, direct mail, marketing materials and social media. CRM systems can also give customer-facing staff detailed information on customers’ personal information, purchase history, buying preferences and concerns. 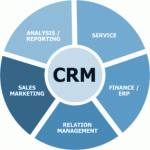 The four main vendors of CRM systems are Salesforce.com, Microsoft, SAP and Oracle. Other providers are popular among small- to mid-market businesses, but these four tend to be the choice of large corporations. Nevertheless, CRM system Sugar was selected as a Top 15 CRM Enterprise according to ISM Inc recently, demonstrating significant advancements in both functionality and connectivity for sales and marketing professionals; offering better decision-making tools for executives; and providing more intimate connectivity with today’s digital clients. On-premises CRM puts the onus of administration, control, security and maintenance of the database and information on the company itself. With this approach the company purchases licenses up front instead of buying yearly subscriptions. The software resides on the company’s own servers and the user assumes the cost of any upgrades and usually requires a prolonged installation process to fully integrate a company’s data. Companies with complex CRM needs might benefit more from an on-premises deployment. With cloud-based CRM – also known as SaaS (software-as-a-service) or on-demand CRM – data is stored on an external, remote network that employees can access anytime, anywhere there is an Internet connection, sometimes with a third-party service provider overseeing installation and maintenance. The cloud’s quick, relatively easy deployment capabilities appeals to companies with limited technological expertise or resources. Companies might consider cloud-based CRM as a more cost-effective option. Vendors such as SugarCRM charge by the user on a subscription basis and give the option of yearly payments. Consider these recommendations when choosing the right deployment option for your business. Open source CRM programs make source code available to the public, allowing companies to make alterations with no cost to the company employing it. Open source CRM systems also allow the addition and customization of data links to social media channels, assisting companies looking to improve social CRM practices. Vendors such as SugarCRM are popular choices in the open source market. Mobile CRM – or the CRM applications built for smartphones and tablets — is becoming a must-have for sales representatives and marketing professionals who want to access customer information and perform tasks when they are not physically in their offices. Mobile CRM apps take advantage of features that are unique to mobile devices, such as GPS and voice-recognition capabilities, in order to better serve customers by giving employees access to this information on the go. Social media, for example, has been touted as a more efficient channel by which customers can reach companies and get problems resolved or queries answered, rather than enduring the traditional method of waiting in a phone queue or awaiting an email response. In some cases, particularly in high-touch customer service scenarios, social platforms can fall short for customer service. Companies also continue to struggle to identify real sales prospects with their data. New lead-generation technologies that combine CRM data with third-party data from companies like Dunn & Bradstreet and social streams have also been emerging to provide sales and marketing teams with better sales prospects. These methods work best, however, when companies spend time cleaning up their existing data to eliminate duplicate and incomplete records before they supplement CRM data with external sources of information.